This article was written on 30 Aug 2018, and is filled under Author: dew. When you reach certain age that we won’t actually mention, the cherished memories of your youth swiftly become fodder for film and television projects that, in the long term, are often seen as regrettable mistakes. Hot on the heels of the recent big-screen debut of R.L. Stine’s Goosebumps novels come two very familiar titles based on books once intended for children and young adults. 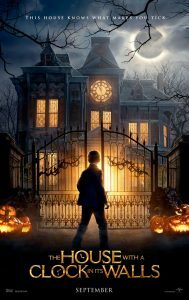 Jack Black, who starred in the Goosebumps film and, more recently, the Jumanji reboot, takes up a starring role in yet another childhood classic, John Bellairs’ The House with a Clock in Its Walls. The novel, a gothic mystery aimed at a middle reader audience, has been in print since its initial publication in 1973, complete with wonderful illustrations by Edward Gorey. It tells the tale of Lewis, a newly orphaned boy sent to live with his mostly unknown Uncle Jonathan (Jack Black, of course), a bumbling warlock living in a home that once belonged to a sinister couple that played at dark magic. With a supporting cast of Cate Blanchett, Kyle MacLachlan, and young Owen Vaccaro as the hapless orphan Lewis, there seemed a good deal of promise about this film from the start — not to mention the perks of a screenplay by Supernatural creator, Eric Kripke, and the director’s chair occupied by none other than Eli Roth. The only real concern is how little promotion the film seems to have. With a release date of September 20, why haven’t we seen more hype for a childhood classic come to life? We’ll have to wait and see. Of course, this is just one of the two films we have our eye on for future release, though while the Jack Black vehicle is ready to go, this next one has just began filming. 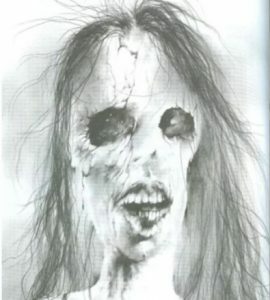 Almost any kid able to read in the 1990’s could tell you all about Scary Stories to Tell in the Dark, a book series full of macabre short stories based part in lore and legend and part in the twisted imagination of author Alvin Schwartz. The titular stories are wonderfully wicked and often gruesome — perfect fodder for a horror film aimed at a younger crowd as well as a fair number of adults who will be reveling in the nostalgia of it all. Artistically, it would seem a daunting task to take on, considering the often startlingly macabre illustrations featured in the original books. However, with André Øvredal (The Autopsy of Jane Doe, Trollhunter) set to direct and Guillermo del Toro producing, we have high hopes for this one! The film went into production this week, with no release date on the books as yet. Are there any other favored childhood books you’d like to see hit the screen?